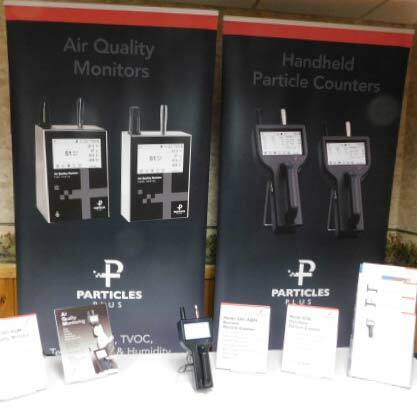 Seven Springs, PA – October 25th – Particles Plus, a Marquis Sponsor of the Healthy Building Summit 2018, was on hand to participate and support its annual event with the theme of IEQ, Remediation & Restoration: Research to Practice. The focus of the event is to bring together the best minds in the IEQ, restoration, and remediation industry to share their experience and their knowledge of how current research and trends in the industry should be changing the way they inspect and remediate indoor environments. The goal was to help ensure that the industry is using techniques, equipment, and standards that are science based. This year’s research utilized rooms provided by Seven Springs Resort, that were set up to explore how the effects of settling particulate in containment rooms varied in different locations within a space, based on the different treatments and practices utilized in each. The rooms under test were monitored for particle count levels in three locations, and the variables that were being explored included positive pressure filtration, negative pressure filtration, rotating air scrubbing designed to disturb the room in multiple vectors while filtering, and a control room with no air scrubbing. The rooms tested were monitored with Particles Plus instruments and sampling began during the initial setup of the containment and sealing off of the room’s mechanical systems. This allowed for confirmation of results similar to last year’s research, that identified extremely high levels of particulate suspension during the mobilization and setup of the containment phase. The research this year was presented on the last day of the event, with graphs and data analyzed. These indicated a number of trends that were expected, and some assumptions that were disproved. “Our involvement and participation in the Research to Practice event for Healthy Building Summit 2018 is part of our ongoing commitment to the development of new methods and techniques that can be used by industry professionals, consultants, and contractors that attend to learn how to provide the best service to their clients,” noted Thomas Grillo, Sales Manager for Particles Plus. Particles Plus has participated in the last four annual Healthy Building Summits and will continue to support this top-quality learning event that brings some of the best minds in the industry together to make a positive impact on the industry and its level of professionalism.